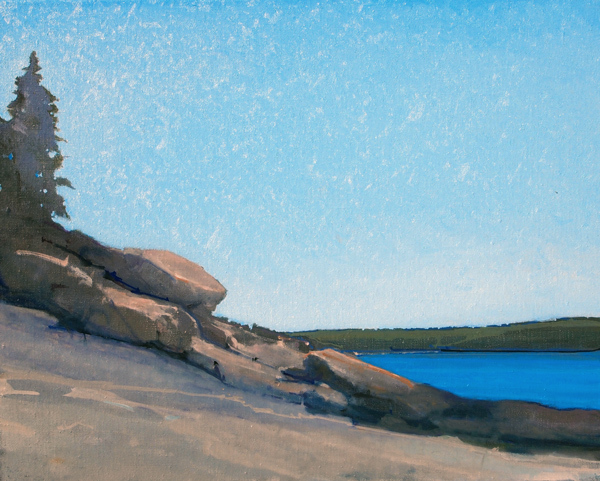 Near Otter Cliffs | Robert Pollien, Artist: Maine, Wyoming, Landscape, Crows. I’ve been working on this view for a (very) long time. Several times I felt close, only to lose my train of thought and have the painting slip away. Interesting. I’ve been re-thinking carious aspects of my work habit. It’s been very helpful in streamlining and making my painting process more directed. This entry was posted in landscape, paintings by admin. Bookmark the permalink. Where is all this New Light coming from?! I’ve really been tinkering with my method. Pretty much just white and 3 colors now, 1 red, 1 blue and a yellow. Sometimes I am overcome by laziness and use Ivory black.